Robley Dunglison. Historical Collections, Claude Moore Health Sciences Library, University of Virginia. 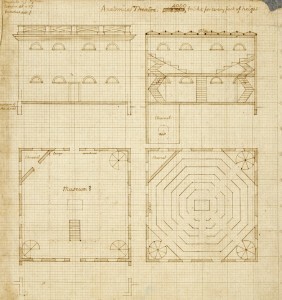 Plan of the Anatomical Theatre by Thomas Jefferson, elevation, two plans and section, ca. 1825. 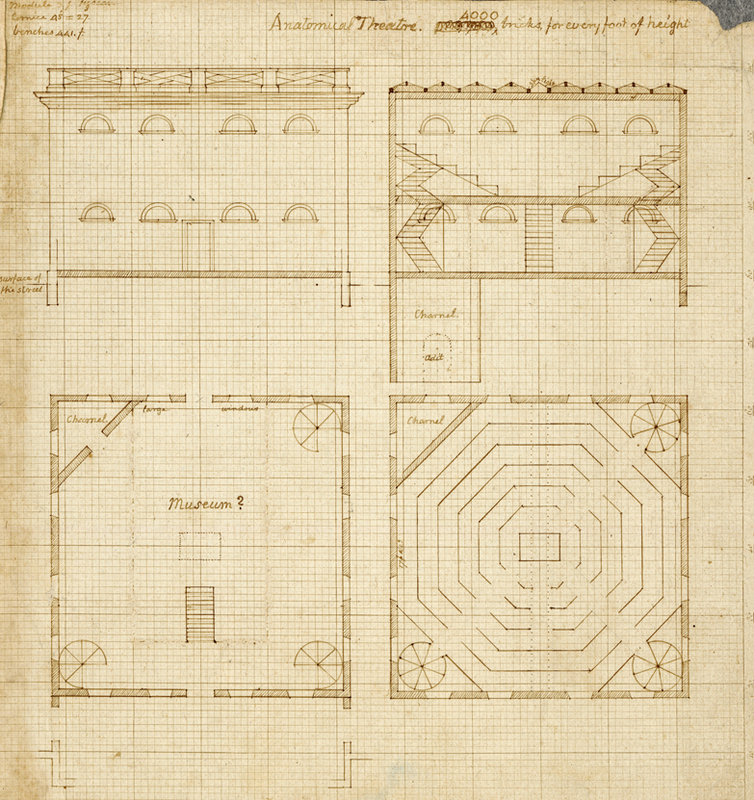 Thomas Jefferson Architectural Drawings for the University of Virginia, circa 1816-1819, Accession #171, Special Collections University of Virginia Library, Charlottesville, Va.
Jefferson’s drawings for the Theatre show a square building measuring 44 feet on each side, with a first floor museum for medical specimens; a second floor octagonal amphitheatre with rising seating; and a charnel, a chamber for bones and dead bodies, in the basement. Access to the charnal is from both the museum and the outside. Circular stairway are placed in three of the four corners from the first floor to the top row of benches on the second floor, and one straight set of stairs rises from the first floor to the center of the second floor. The windows are all lunette shaped, and a skylight goes the length of the roof. The height of the building from the top of the skylights to the bottom of the charnal is also 44 feet. Wax Anatomical Models, Museo di Storia Naturale di Firenze, Zoologia “La Specola,” Florence, Italy, September 2006. 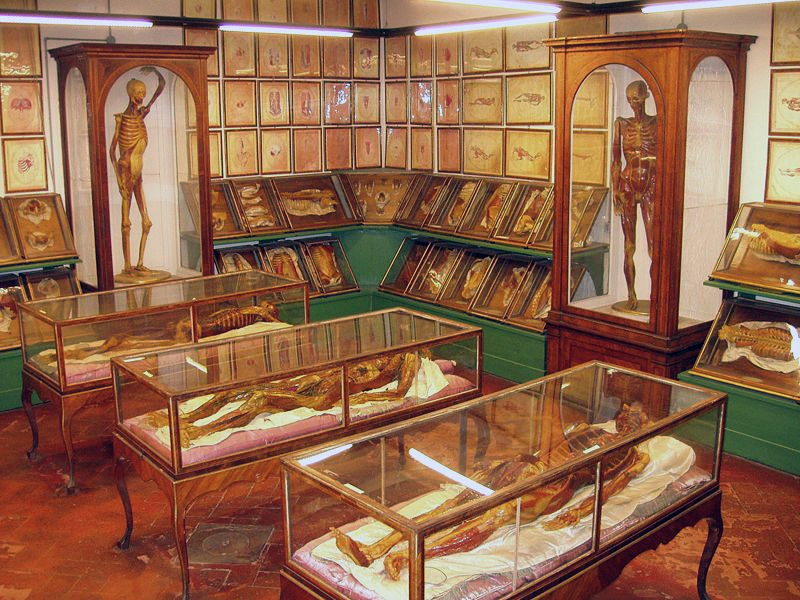 The Museum of Zoology and Natural History, best known as “La Specola” in Florence, Italy, has ten rooms dedicated to anatomic waxes, an art which reached its pinnacle during the 18th century and was used to teach anatomy without cadavers. https://commons.wikimedia.org/wiki/. Thomas Jefferson to Joseph Carrington Cabell, 11 January 1825. Founders Online, National Archives. This is an Early Access document retrieved from The Papers of Thomas Jefferson: Retirement Series. Thomas Jefferson to Joseph Carrington Cabell, 11 January 1825. University of Virginia, Board of Visitors. Minutes, March 4, 1825, 83-84. Retrieved from http://guides.lib.virginia.edu/bovminutes. Puzio, Dominic. “The Anatomical Theatre (1825-1939).” JUEL, June 8, 2015. Retrieved from http://juel.iath.virginia.edu/node/242. Radbill, Samuel X. (Ed.) The Autobiographical Ana of Robley Dunglison, M.D. Philadelphia: American Philosophical Society, 1963, 23. Dorsey, John M. (Ed.) The Jefferson-Dunglison Letters. Charlottesville: University Press of Virginia, 1960, 17; Thomas Jefferson Papers, 1606 to 1827. Library of Congress, Washington, D.C. https://www.loc.gov/collections/thomas-jefferson-papers/. Bernard Peyton to Arthur S. Brockenbrough, May 13, 1825. Papers of the Proctor of the University of Virginia, RG-5/3/1.111, Box 5: Folder 482. Special Collections, University of Virginia Library, Charlottesville, Va.; Dorsey, 23. University of Virginia. Catalogue of the Officers and Students of the University of Virginia, First Session, March 7, 1825 – December 15, 1825. Charlottesville: Chronicle Steam Book Printing House, 1880, 8. University of Virginia, Board of Visitors. Minutes, October 3, 1825, 103-104. Jules Cloquet was a professor of clinical surgery and surgical pathology in Paris. He was the author of a large anatomical atlas with five volumes, issued between 1821 and 1831. 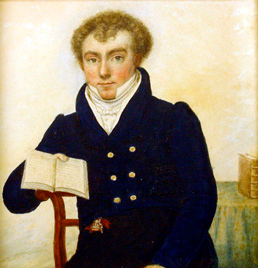 Francois Carlo Antommarchi was a physician and surgeon who served as Napoleon’s doctor on Saint Helena. 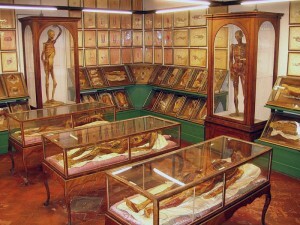 Prior to that, he was a prosector to the renowned anatomist Paolo Mascagni. From 1823 to 1826, following Mascagni’s death, Antommarchi published Mascagni’s plates under his own name.